London police detective Maeve Kerrigan has spent plenty of time at Murchison House. One of the many cement high-rise towers comprising the Maudling Estate housing project, Murchison Tower is home to a motley mix of society. From domestic abuse victims and elderly widows with nowhere else to turn to its flourishing criminal elements, Maeve is familiar with many of its occupants by name or reputation. But when a fire breaks out at Murchison House that consumes the top floors and leaves three dead, Maeve and her colleagues are startled to learn the identity of one of the victims. Geoff Armstrong was a wealthy, notoriously right-wing London politician – the last person they’d expect to find in a place like the Maudling Estate. And things get even murkier when evidence surfaces indicating Armstrong was murdered before the fire broke out. Was his death connected to the fire? To the other deaths at Murchison Tower? And what was he doing there in the first place? This was the best police procedural that I have read in a long time. I sometimes have issues with procedurals bringing so many police officers into the investigation that I can’t keep track of who’s who. That’s not a problem in After the Fire! Even with an entire department full of characters to keep track of, plus the residents of the burned out high rise, there was never any problem keeping people straight. Each individual in the story was just that – individual – which made them all memorable and the story easy to follow. That doesn’t mean that it was easy to guess what was going on or who was doing what, however. Once I got started, I didn’t want to put the book down until I reached the end. It was fast paced, suspenseful, and occasionally shocking. If you’re a mystery fan, I highly recommend this one, whether or not you have read any of the other Maeve Kerrigan novels. I have to thank Minotaur Press for introducing me to another “always-buy” author for my list! NOTE: I received a free copy in exchange for my honest review. All thought and opinions are my own. I have had this one on my tablet for awhile. I will have to make a list and follow it. 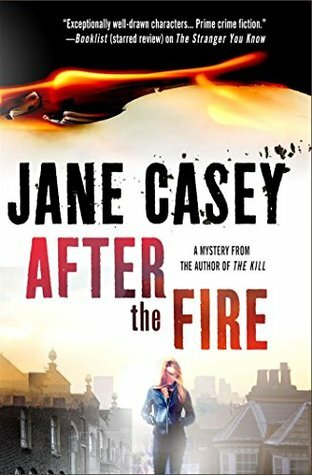 Time to read Jane Casey again.